Line the bottom and sides of an 8×8 baking dish with parchment paper. Make sure to leave enough paper along the edges so you can pull the granola bars out after they set. 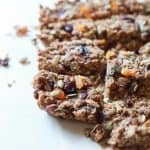 In a large bowl add oats, almonds, ground flax seed, pepitas, dried cranberries, dried apricots, sea salt, and pumpkin spice. Mix ingredients with a wooden spoon. In a small microwave safe bowl add peanut butter and maple syrup. Microwave until the mixture is smooth and somewhat runny, about 1- 1 1/2 minutes. Add peanut butter mixture to dry ingredients. Mix everything together until everything is completely coated. Place mixture in parchment paper lined baking dish. Put granola bars in refrigerator for 1 hours to solidify. Cut and serve!